In applying to the emPLANT Master program during the first call (from Oct to mid-Jan) you automatically apply for an Erasmus Mundus Joint Master Degree (EMJMD) scholarship. In applying to emPLANT during the second call for application (from mid-Jan to end of Feb) you apply as a self-funding student. To see how EMJMD scholarships are awarded, please refer to the selection procedure section. Both documents must have been issued within 12 months before the submission deadline of applying for an EMJMD student scholarship, i.e. the consortium’s official deadline for student application. 12-months residency rule: Applicants with Partner Country citizenship who have carried out their main activity (studies, training or work) for more than a total of 12 months over the last five years in any Program Country are considered Program Country applicants for participation costs. 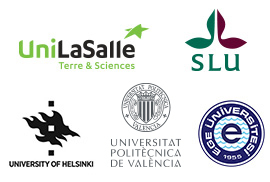 The funds corresponding to “Contribution to emPLANT participation costs” are directly collected by the emPLANT Consortium and are not transferred to scholarship holders. The scholarships available in each intake are not fixed.